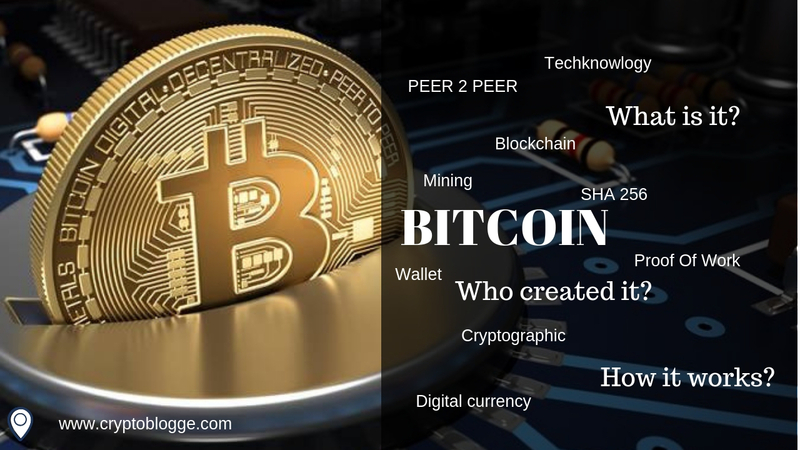 Bitcoin is a digital cryptocurrency which is fully decentralized and works on internet. Bitcoin is A Peer-to-Peer Electronic Cash System. The idea of Bitcoin came in the front of the world in 2009. But the idea of digital currency was first placed in the front of the world in 1990 by the company DIGICASH INC. Due to the lack of security, digital currency idea was failed in 1990. But when in 2008, when the financial crisis came in the front of the world, demand for an independent and decentralized currency started again. When all the world facing financial crisis at that time on 18th August a domain was booked on the internet in the name of Bitcoin.org, Not only that, on January 3, 2009, a group or man named Satoshi Nakamoto published a document and an open source software on internet which can create BITCOIN. The person who first noticed the open source software his name was Hal Finney. Because Hal Finney not only downloaded the software but also he did the worlds first BITCOIN transaction of 10 Bitcoins with Satoshi Nakamoto. To know it better first you have to know how fiat currency (Dollar or rupee etc.) Is created. Thousands of years ago Peoples were exchanging foods or services with their food or services.This last for very long time. After many years some smart peoples decided to use something else for the exchange purpose, which is rare and valuable. Then they found GOLD, there is not much gold in the world and it’s difficult to mine. Then the gold time started the people started exchanging everything for gold, like food or services. Then people saw value in gold, and they realizes that will run of one days, so they stared storing gold which is very heavy and that make them in trouble. After that people got another idea, to store gold in Banks. Government started print special papers called Bank notes. all bank notes have different numbers written on them. Thats why people know how much amount of gold they are storing. Then peoples started using bank notes which is fiat currencies for their exchange purpose. As bank notes not require mining, So government could print as many as they want it. then value of bank notes decreases which we called devaluation. Bankers started exchanging bank notes to get huge policies in return. Now money rules the world. That’s why Satoshi Nakamoto (a person or group of people) created a new type of decentralized currency for the world , so the government and the banks would not control, they named it BITCOIN. To prevent forgery they invented a complicated cryptographic algorithm to create a new Bitcoin . To prevent any fraud, they decide to register all Bitcoin transaction in one big single ledger which they called a Blockchain. Bitcoin is the first decentralized digital/virtual currency. This means there is not any authority which controlling bitcoin and its price. Its driven by the community who uses it. This is an electronic payment system based on cryptographic proof of work instead of trust. Sending or receiving Bitcoin from one placed to another place is called a transaction. Btc transactions are straight between sender and the receiver and done through a pear to pear networks. This means no middle man is involved within a transaction. But in banks if I transfer money then 3 banks will be involved. 1- my bank, 2- receivers bank, 3- central bank which will make that transaction happens between both banks. All transactions in a Bitcoin Blockchain is public buy anonymous. This means anyone can see which transaction is done how much btc was send or received. But you can’t trace who send and who received because you can only check the wallet ids only. Mining nodes collect the transaction blocks in a full page Ledger book, where Block contains the information about transactions and previous Block (Block Chain) linking to the first block when Bitcoin Network started. The same Blockchain file is maintained on every node carries a proof of work. Some Btc were rewarded to the computer which solves the proof of work. After this new block is generated and automatically linked to the Blockchain. First transactions of a Block is a special transaction and some coins rewarded to the owner. Transaction history can not be changed in a single block. If someone try to change the transaction history of a particular block, then the record will be not matched with the record available in other nodes world-wide. Yes there is a chance to change transaction records in Bitcoin block-chain. To change a transaction history you have to change the particular transactions in more than 50% nodes computer. To do this a have to own more than 50% computational power of bitcoin Blochchains miner’s. Which is impossible now a days because number of miners are increasing day by day. To create new bitcoin people have to solve large encrypted transaction through powerful computers (solves proof of work). This process is called mining. Every conformed transaction increases security of the network. In bitcoin network any user can be miner and get reward for conforming transactions . 1- they will get transaction fees for the transactions they conform . Mining is a competitive market and the network is more secure when it have more miners. According to Satoshi Nakamoto’s Bitcoin Algorithm there will be maximum of 21 million BTC will be came to circulations. Of which 17.3 million BTC already produced. Currently 12.5 Bitcoins are mined per block and a new block is generated in every 10 minutes in a steady rate. In January 2009 when Bitcoin network is started , reward per block at that time is 50BTC . After every 210,000 blocks block reward decreases by 50%. Math tells that all BTC (21 million) will be generated in the year 2140. After 2140 the incentive will be only the transaction fee . Initially BTC can be mined using CPUs but now now a days graphic cards and dedicated chips are required for mining. Miners are rolling main part to make network Impartial, Stable and Secure. Bitcoins ownership and transfer are ensured by crypto private and public keys (digital signatures). Bitcoins transaction are encrypted with SHA-256 algorithm. The every mining nodes uses their computational power to solve and give conformation.Transaction is not completed until 6 miners gives conformation to it. Bitcoin’s Proof of work protocol is always challenging the mining nodes, Its tough to be solved and X Easy to be verified. Every 2 weeks Bitcoin generation ratio is auto adjusted, Increase or decrease in difficulty of proof of work targets the number of transaction occurs in 10 minutes block generation. Transactions in a block-chain are protected by a mathematical race. In bitcoin network, attackers always have to compete with network power using their own computational power. Time stamp server helps to order the transactions within blocks, by placing hash of all data in a block including hash of previous block. Generally Bitcoin network takes 10 minutes to solve the proof of work where typical PC can take up to several years to complete it. Extremely unlikely, however a pair of or a lot of nodes could solve the Proof of Work at same time. Block-chains branches are created like this. Tie is broken when someone configures the block. Nodes will be auto switched to the longest branch. Blocks are going to be discarded and individual transactions will be handled by the wining branch. By this block-chain stabilizes and nodes are agreeing with the chain’s sequence. Bitcoins can be stored in a Digital Wallet like Web services, Local applications and USB drivers which are protected by Private/public keys. Loosing your private key is like loosing your bitcoins. They will be gone forever from Bitcoin’s Economy. Bitcoin’s smallest fraction is called Satoshi. No one can change the software of BTC network until majority of network users accepting the change. Attackers can’t harm the Bitcoin system, because the majority of nodes are honest. They will need astronomical power to corrupt it. Double spending attacks on bitcoin’s block-chain are protected by the Time stamp server/Hashcash. Transactions can not traced practically, so criminals using this more in illegal cases like money laundering, trading drugs and weapons etc. Bitcoin is pear to pear digital currency with cryptographic protection. No centralized unit is controlling it. If it accepted worldwide then no government can print more money. It gives anonymity in transactions. With this anyone can make global transaction in very less cost and in some minutes.